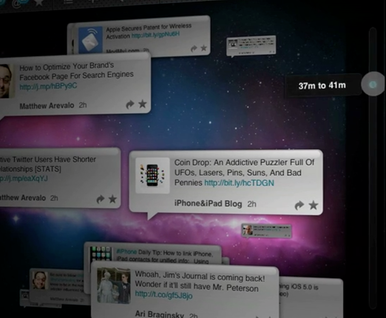 TapFactory on Thursday released TweetyPop for iPad, an app that reinterprets what it means to be an iOS Twitter client. TweetyPop offers two main ways to your read your tweets: You can use a more traditional list view, or you can browse tweets in a pseudo-3D view instead. TweetyPop mostly focuses on the latter approach. If you suffer from my own sickness (namely, that I attempt to read every tweet on my timeline), TweetyPop may not be right for you. But as you can see in the developer’s video demo, TweetyPop’s time navigation feature is undeniably cool, and could certainly enhance the Twitter experience for more casual tweet readers. Of course, the app offers support for core Twitter features like replies, direct messages, favorites, and lists, too. TweetyPop costs $2 and requires iOS 3.2 or later. Generic Company Place Holder TweetyPop - Twitter, Reimagined.